Welcome to Day #6 of Nibs Theme Week. 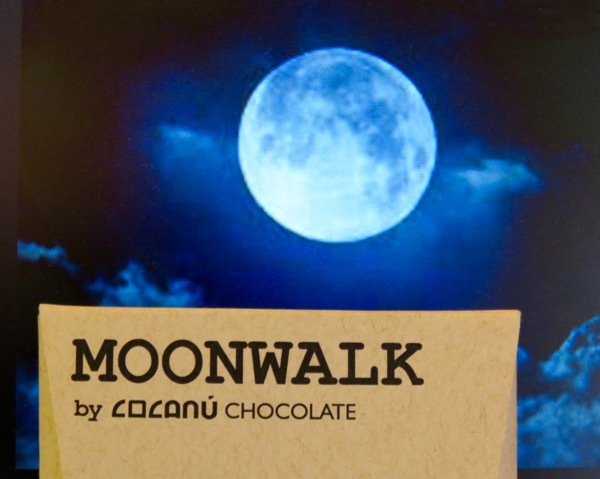 Today's Moonwalk bar from Cocanu Chocolate (Portland, OR) was a dark chocolate bar with cacao nibs "dreaming of walking on the moon." 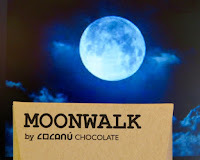 A few days ago we had a gorgeous full, pumpkin-colored moonrise, that a friend and I observed from a hilltop in San Francisco, so this Moonwalk bar had special appeal. Normally, nibs pep up a bar all by themselves. However, the Nacional nibs from Ecuador in this 65% dark bar received a subtle boost from some embedded Pop Rocks. The tiny edible bursts were not enough to break out of earth's orbit, but provided a bit of subtle concept fun. The bar's dark chocolate base was crafted from Venezuelan Criollo cacao and had a complex, balanced and subtly sweet, almost smoky, earthy, fruity aroma and flavor. The chocolate had an even melt and relatively creamy texture. There was one tiny off note, perhaps from a nib. The Pop Rocks yielded a few small sweet, crunchy bits, but may have lost some of these sizzle during the long flight to the moon. The finish lingered in a pleasant way for about 20-30 seconds after the last bite. 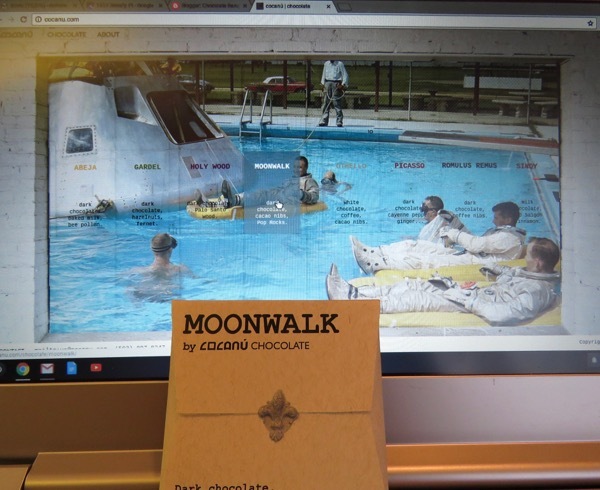 And now, thanks to this Moonwalk bar, I'm leaving for a chocolate-powered walk, here on Earth.